Cheliax's largest city, Westcrown, has fallen to the Glorious reclamation, and the evil adventurers are sent to reclaim the metropolis in the name of House Thrune. Armed with the legendary weapon they created from a gold dragon's head, the nefarious characters confront the Glorious Reclamation's forces and break its siege of a nearby Hellknight citadel. Once the army is defeated the villains enter Westcrown, where they must undermine the chivalrous knights' rule of the city. Finally, they face the founder and Lord Marshal of the Glorious Reclamation to end the rebellion and restore the Thrice-Damned House of Thrune's rule over the empire of Cheliax. 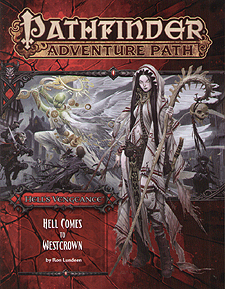 "Hell Come to Westcrown," a Pathfinder adventure for 15th-level characters, by Ron Lundeen. A look at how the city of Westcrown operates under the rule of the Glorious Reclamation, by Ron Lundeen. Advice and suggestions on how to expand your campaign beyond the Adventure Path's conclusion, by Ron Luneen. An infernal confrontation and the waking of a powerful ancient weapon in the Pathfinfder's Journal, by Josh Vogt. A collection of formidable monsters, by Jason Keeley and Ron Lundeen.